This week was the last week of #artmooc: week 7. We thought that all we would have to do this week would be to peer review at least two other Collections; *if* we had produced a Collection of our own. You have to earn the right to peer review. And then – they threw a critical evaluation at us! We had to find a piece in a real gallery or online, research it – and write our own critique. Well there was a new challenge indeed – not least because I had booked a couple of days’ vacation – and away from the Internet – so I did not see how I could get this task done. So I chose a piece of sculpture that I loved – and Googled it – and there it and the artist were on Wikipedia… So I made notes – followed links – and made more notes. My trick is key word, pattern notes – not taking down whole chunks of information – but snatching points of interest. When I had one A4 side of paper complete with what I thought were good notes, I stopped… I did a quick free write upon my sculptor and his piece just to get some words down on the page – and to prime my brain for the real writing that was to come. Later that week, back in contact with the web, I sat with my notes and numbered the different points that I saw in there from 1-13… then opened my free write, ‘saved as’ version 2 – and I wrote in one go the first draft of my critique. I put together a draft ‘background’ and ‘influences’ part of my piece from my notes – following the order of my numbering. Then I wrote my critique of the sculpture itself. I re-read and tweaked - and because of the time scale - and the target audience - I stopped. If I had been doing this as a piece of University writing, I would not have stopped at one source – and definitely would not have brandished Wikipedia around like a flaming banner… But I thought that it was all okay for this piece and this time limit. So – instead of shunning Wikipedia – perhaps we should set a timed writing exercise that allows the use of Wikipedia – so that people can experiment with notemaking – thinking – researching – writing… and then allow them to take away their drafts and improve with additional research? Below is the piece that I wrote… and below that some last videos from Penn State upon art and creativity and metaphor – and that I will also use in my practice later on. Serra is an American minimalist sculptor and video artist – and I am writing a brief critical consideration of his piece, Fulcrum, which is constructed from three nearly-60-foot pieces of COR-TEN-Steel learning against each other. COR-TEN-Steel is also known as mild steel – and it differs from Stainless steel in that it will oxidise and rust. This steel therefore will interact to some extent with the elements; it does not just impose on a space – but also interacts with it, changing slightly over time, as does the space itself. Serra was born in1939, San Francisco. He had a Literature background and studied painting on an NFA programme at Yale, 1961-64, with Brice Morden, Chuck Close, Nancy Graves and Robert Mangold. He supported himself by working in the Steel Mills (http://en.wikipedia.org/wiki/Richard_Serra). He studied under and was influenced by Philip Morton and Guston Feldman. In 1963 he wrote ‘Interaction of Colour’ with Albers. His early sculpture was in unconventional fibre glass and rubber and was abstract and process-based. He would also work in lead, creating pieces by hurling molten lead spheres at a wall. Process Art can be seen in the acts of gathering, sorting, collating, associating and patterning – and in the initiation of actions and proceedings. 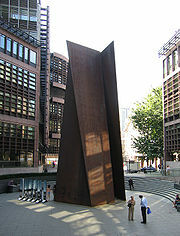 Serra’s work has been compared to Dadaism and also to the Abstract Expressionism of Jackson Pollack (Ibid). The performance of the artist in the production of the art work harnesses the body’s movement, initiates improvisation and celebrates the realisation of the random. Serra is known as a pioneer of LARGE, site-specific sculptures/installations designed to challenge our perceptions of a space and of our own bodies as we move around the spaces he creates (Ibid). From 1969 Serra experimented with cutting, propping and stacking lead and timber to create sculptures held in place by their own weight (Ibid) moving on to large steel sculptures in the 1970s. The elements of his minimalist COR-TEN-Steel structures are produced in Germany and installed by Budco Enterprises, a Long Island Rigging Company with whom he has maintained an extensive working relationship (Ibid). Wikipedia cites as influential upon Serra’s work Marshall McLuhan’s (2005) Marshall McLuhan: Theoretical Elaboration Vol 2.; where McLuhan elaborates on the complex network of relationships between people and objects. It also cites the modernist novel, Pynchon’s The Crying of Lot 49 which is said to concern itself with the ‘waste’ in language, focussing on the power that negative space has to determine outcomes (Ibid). In this light, Serra’s minimalist steel constructions could be said to expose the essence of a space or of our relationship to that space by eliminating all the non-essential elements of the piece. In its simplicity it could be said to embrace the Japanese aesthetic of Ma, negative space (Ibid). I chose to write about Serra’s Fulcrum before I had researched the piece – basing my choice upon the fact that it is a public sculpture with which I have had a long term ‘relationship’ and which has moved me in very real ways over time. However, this is COR-TEN-Steel and it weathers with age. It rusts and mutates and changes. Perhaps if Fulcrum is making a comment then upon big travel and big finance, it is that all is mutable – all turns eventually to dust. It could be said to mock that which thinks itself so powerful – so in control of our world. And whilst Fulcrum creates a huge cathedral like space, unlike a cathedral which imposes GOD and god’s will upon ‘man’ – this space allows anyone to walk in and around and under. You can lean inside against a wall and gaze up at a small patch of grey or blue sky and just dream for a moment – swept away as though in a wood or upon a mountain. Ironically, this vast piece echoes or recreates a Goldsworthy moment in the midst of the urban. It should not be possible that something this huge and brutal could do that – but it does. In this vast piece you can be for a moment Lost in the City – and connected with the air and the sky – perhaps with the rain. You can be in a very different mental and physical space to that created by monolithic architecture and monitored-access Malls. *This* space grants a moment’s reverie. This space welcomes everyone – and allows them to be – to connect with air and sky (if they choose) – and to be different. You might hide in Fulcrum to have a solitary cigarette (there is no smoking allowed in doors anymore) and in this space you are not shunned – you are not a pariah – just a fallible human being – allowed to be. Some people complain that Fulcrum is used occasionally as a urinal… but even that is human – and perhaps offers some refuge and respite to a homeless person when no one and nothing else will. And the transgressive act will soon be cleansed by the rain – no permanent damage done – no terrible crime committed. When I first spotted this enormous and strange piece outside the station I used to walk swiftly by – it was obviously ‘art’ and therefore not for the likes of me. Just being ‘art’ set up a wall – a ‘do not touch’ feeling… Over time, Fulcrum itself dispensed with all that – and enticed me in. Here it was in fair weather and foul – to be walked in and under and around – and it took my breath away. I felt privileged to be allowed to experience this wonderful, huge thing. This sculpture. This art. And the more I could ‘take it for granted’ – the more it drew me in and gave me space to be. I truly love this piece. It is huge and brutal – but it is welcoming and human somehow. It imposes – and it welcomes. It stands guard – but it embraces. I love that we the people are accredited the wit and wisdom to appreciate and inhabit such a wonderful sculpture. I cannot imagine that these cruel, neo-liberal times would ever again take a risk of producing this and letting it loose amongst the public; I am so glad that Fulcrum exists – and that I got to inhabit, experience and be within it. I especially love the first example where he persuades people that they can risk drawing, by drawing with his foot! That’s one up from ‘blind drawing’ – will try that next time! How do you grade art? Objectivity and subjectivity in art… The four Cs – craft: how it’s made, technical virtuosity – but more than that…– creativity – the idea behind it – for example Duchamp’s found objects – remember the horror at the fountain/urinal… content – composition… and the more we know, the more we will see. Creating metaphors to engage children in pottery – but that did bring the pottery alive… Everything an artist makes is a metaphor: something that references something else; which can be brought alive when we ‘notice what we notice’. Thinks that you can teach creativity – especially if we let go of the concern of coming up with the wrong answer!